According to the Central Florida Research and Education Center, the ficus tree was introduced to Florida nurseries in the 1950's. Since that time, the trees have become popular in the state, with a wide variety of cultivars available. 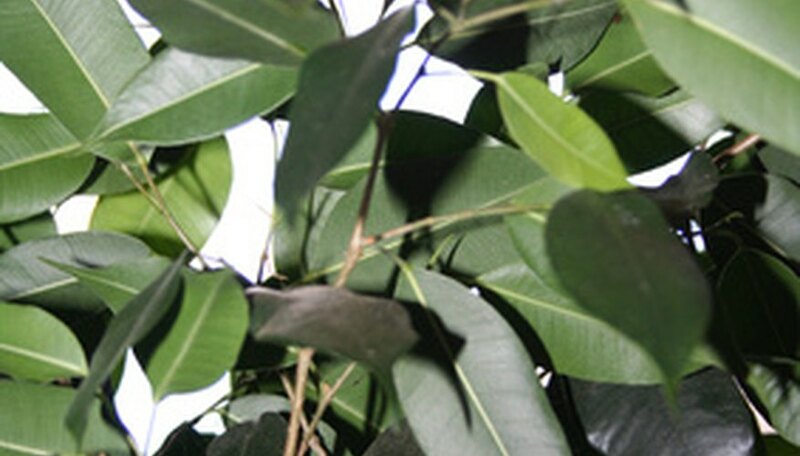 Some diseases are more prevalent in Florida ficus trees because of the climate. Knowing how to spot, prevent and react to the symptoms of disease can help you keep your ficus healthy for years to come. Knowing the early warning signs of ficus disease can help you fend off the problem before it becomes serious. Wilting leaves, even when your tree is getting plenty of water, are a problem. Also, watch for black, brown, white or yellow spots on the foliage. Finally, look for lumps or swollen areas on the branches or twigs of the tree. These also can be a sign of infection. Ficus scale can be a problem for outdoor ficus trees. The scale is caused by small bugs, and often is accompanied by a secondary infection of mold or mildew, which causes the leaves to develop a black coating. Mold and mildew can create problems for ficus trees because people tend to water them with sprayers, which wet the leaves and create a humid, warm environment for mold and mildew spores. Root rot can be a problem if you keep your ficus in a pot and water it too frequently. Root rot is characterized by wilting leaves even when the tree is getting plenty of water. Finally, cankers can be caused by bacterial or fungal infections the tree picks up in exterior wounds. These cankers cause bulbous, swollen areas on the branches and can kill the branches or tree if not controlled. Florida ficus trees often spend parts of their lives outdoors, then are moved inside when temperatures drop below 50 degrees F. Many diseases strike during the stressful period of the move. Trees are more susceptible because they are moved to areas with less light or poor circulation. Mold and mildew can grow on your tree for months or years without causing more than cosmetic or contagion problems. Cankers can take years to swell to the point of being a serious issue . However, scale disease and root rot can kill your tree much more quickly, possibly within a single growing season. If your ficus develops a disease, isolate it from other ficus trees in your home or yard immediately. Use a sterile pruning technique to remove all affected leaves and limbs, and try to diagnose the problem. Spotted leaves are usually a product of a fungal infection, and can be controlled with sterile pruning and careful removal of affected plant debris. Changing the soil in the pot or cleaning out the area underneath the tree can also help. Mold and mildew require sterile pruning and an adjustment to watering habits, including watering with a drip hose in the early morning and making sure the tree gets plenty of sunlight and has good air circulation. Cankers also should be removed via sterile pruning, usually in cooler months when the infection is less likely to spread. Root rot can be treated by making sure the tree is not overwatered, but it is frequently a death knell for the plant. All of these ailments can be treated with fungicides or bactericides. The best way to deal with ficus tree disease in Florida is to prevent it entirely. You can do this by always making sure your ficus gets plenty of sunlight and is in well-drained soil. A variety of pesticides are available to fend off insects and infections. If your ficus serves time as a houseplant, make sure these treatments are safe for animals and children.